UX is becoming a regularly heard but poorly understood profession. This is even more so the case within the healthcare sector which has been slow to adopt UX practices and philosophies. Aimed at absolute beginners, during this crash course session, Dr Gyles Morrison will cover the big what, why, and how questions relating to UX. He will also explore the role clinicians and multidisciplinary teams can use design thinking to improve digital health and healthcare services. Why do we need more healthcare UX specialists? Where do UX Designers work? How do UX Designers improve healthcare? What does a UX professional do? What tools and resources do UX professionals use? Misha Patel is the London CUXA Community Manager and User Experience Researcher and Designer at Amaze; her aim is to understand how people interact with their world and design meaningful solutions for real life problems. She is passionate about innovations in digital health such as designing for health behaviour change. 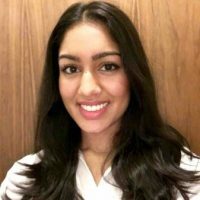 She has a MSc in Human Computer Interaction and Ergonomics, and a background in Psychology, with some experience working in the mental health sector.